Released for sale this month, the new Assistive Listening System by Media Vision provides a feature package for wireless FM listening devices in assembly areas at a competitive price. While not new to assistive listening – Media Vision already delivers hard-wired and infrared solutions – the company dedicated to audio intelligibility is now openly expanding its application range. Operating in the FCC designated assistive listening frequency band 72-76 MHz, using all available wideband and narrowband channels, the Media Vision assistive listening system allows up to 6 simultaneous transmissions. Programming, channel assignments and settings lock, can be done either from the transmitters and receivers with clear OLED display for menu navigation, or from a user-friendly software interface. The system offers greater than 70 dB SNR to provide the user with clear audio in any situation. 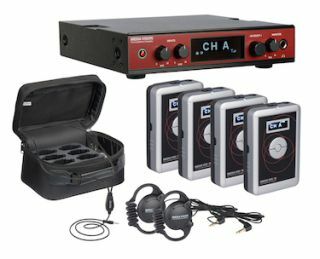 The product line includes portable and fixed rack-mountable transmitters, compact receivers powered by standard AA alkaline or rechargeable NiMH batteries with removable belt clip or lanyard carrying options, charging stations with storage cases, as well as a variety of microphones, headphones, and a neckloop compatible with telecoil-equipped hearing aids. “We deliver an elegantly-designed, high quality audio solution that integrates the most desirable functionalities at a very affordable price,” said Fardad Zabetian, CEO of Media Vision. The solution offers the right flexibility to AV systems installation providers with various mounting options for the transmitter’s antenna, including a remote dipole antenna with operating range up to 1500 feet, as well as an option to add Dante audio input connectivity. The portability of FM systems makes them popular with most meeting facilities that must meet ADA requirements including classrooms, worship facilities, and other assembly areas. “Adding this solution to our selection of wired channel selectors and infrared receivers allows us to best cover user-requirements and the needs of our installation partners“, said Fardad Zabetian. This marks the second new market extension for Media Vision in 2016; their earlier announcement described entry into the streaming market with a solution for multi-audio-track streaming and recording primarily intended for multilingual applications. The San Francisco-based company with offices across North America and in 5 European countries is best known as the distribution partner for TAIDEN conference systems. “Our entry into the manufacturing world may come as a surprise to some, but we are always on the move and looking for innovative solutions.” explained Fardad Zabetian, “We remain focused in conferencing, we come into assistive listening with a projects-based approach and dedication to systems integrators; they are leading us to provide an expanded range of solutions”.For more information, visit http://www.media-vision.com/en/products/assistive-listening.